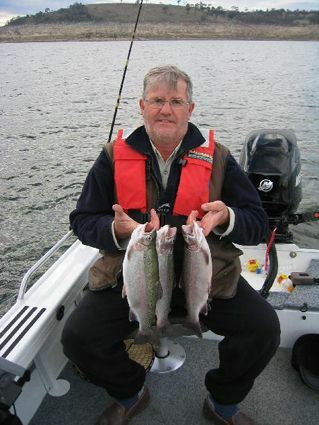 Fishing has been good and bad depending upon location and conditions. The good reports have been very good but some anglers have done it tough. 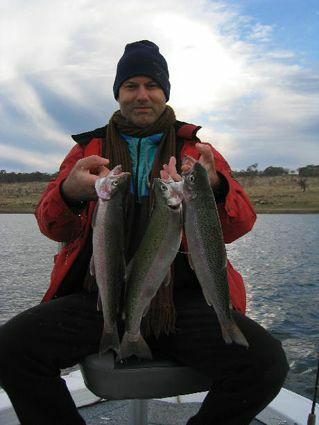 The quality of the Lake Eucumbene Rainbows is astonishing at the moment. This time last year they were snakey , skinny, slabs but right now they are fat little footballs that fight hard and are going great on the plate. Check out a couple of the photo's in the reports below. Great Fish. Eucumbene and Thredbo rivers are up a little and are holding a few spawning fish for lure and fly anglers. There are spawing fish in the Eucumbene and Thredbo so Glo Bugs and Nymphs will start coming into their own as well. 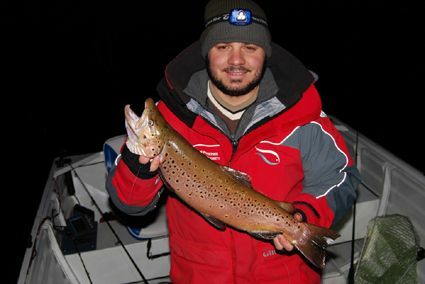 While the run is not huge yet there a few fish to try and tempt. Any good rain over the next few weeks will see a bigger run of fish entering these rivers so keep you eyes on the weather forecasts. With the new moon after dark with Lumo Flies should start to work well this week. Dianne and I spent a week doing a little R & R on Eucumbene at Buckenderra. We trolled most of the time and christened the new boat with a few Rainbows and one released Brown. 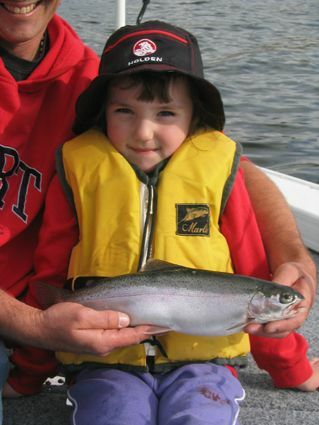 Attached is a photo of my 5 year old grand daughter with a 40cm Rainbow. 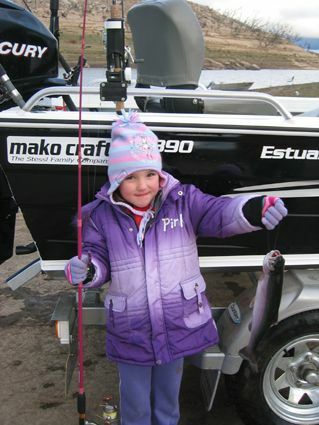 Apart from handing her the rod she managed the fish on her own to the boat. It was caught on her Lisa Simpson rod she got from Santa last year. Took a purple Alpine special on a flat line and what a thrill as we had 3 other lures out there and it managed to take Sam's. She is planning her next trip I believe. The fishing was rather quiet and it did not matter what time you hit the water as most fish were taken during the day using flat lines and lead core. The Tassie Y82 (Canberra killer) was the most productive colour with all those who caught fish. I actually caught one myself, a nice 43cm Rainbow and my son Andrew boated a 45cm Rainbow Sunday morning prior to going home. 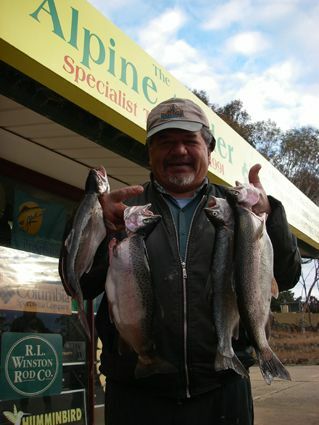 Thought you would like a report on the fishing at Eucumbene this week. I took a mate (Eddie Niovani) up to the cabin for a few days fishing. We trolled out of the new boat, a 3.9 Makocraft ETT and what a difference having the extra room and stability. This week has been the best fishing I have seen for a while. We fished out of Buckenderra and I must congratulate Peter and Jo for the dedication they have towards the fisherfolks, including the continual moving of the boat ramp so we may all launch our vessels. Yes, those certain persons are still taking water for down stream and you can see it disappearing on a daily basis. Anyhow at least we can still get on the water which is a bonus. As can be seen from the photo's Eddie had a great time this trip as we both bagged out on the two days. Let a lot of fish go but kept 10 each to take home. Only caught two browns but the one in the photo was a fat one as can be seen. It only weighed 1.5kg and was full of fresh yabbies. We trolled all of the fish and started with Tassie Devil number Y82 but that was a little slow as there is a thermocline between 10-15 feet and most of the fish were below that or just in it. So it was time for the Rapala Red/Black broken back Shadrap. Within two minutes it went off and continued to fish well as these lures fish at around 15 feet. We probably caught 20 plus fish on these lures over the couple of days. Anyhow see you guys in a couple of weeks. Colour wise Tassies in yellow wing patterns have been excellent with Y82 and S12 the continuing stand outs. #55 and # 26 have been popular too. Dual Depth Tassies in these colours are great too. Rapala Jointed Shad Raps are great at the moment. The Glass Shad Raps are another great fish catcher in the Rapala range. Experienced <?xml:namespace prefix = st1 ns = "urn:schemas-microsoft-com:office:smarttags" />Melbourne snapper fisherman Rocco Ciccosillo with a nice 6lb Jindy brown taken on a Rapala minnow. Only the one report form Jindabyne this week. But a very nice fish. 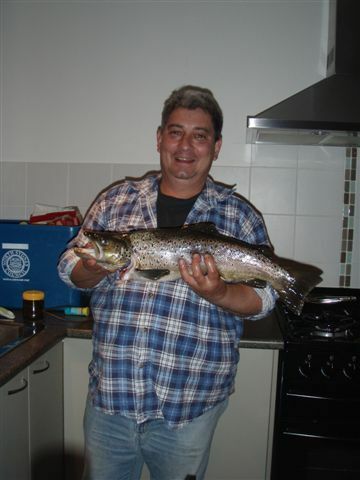 Below is a great fish of 585 mm long 1.8kg cleaned caught at Lake Jindabyne on 26/4/08 just on dusk with Mudeye bought from you guys. 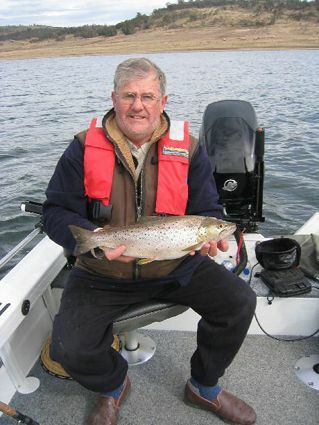 Paul Stanley above with his great Brown. *Local Johnny 'Scrubworm' Pene had a good session at Seven Gates recently. He caught six good Rainbows keeping four. Mudeyes cast out a long way were the fish takers. Johnny always greases the main line between the float and the reel with silicone mucilin so that it floats. This keeps the line out of the weed and grass and means the fish feels less resistance when it takes the Mudeye. Little details like this can make a big difference to your catch rate.